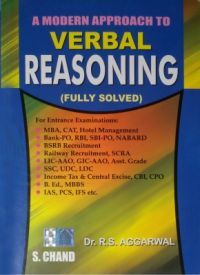 A Modern Approach To Verbal Reasoning (Fully Solved) is a book on verbal reasoning for a number of entrance and competitive examinations such as MBA, Bank PO, IAS, and SSC. It comprehensively covers a wide range of questions asked in such examinations, including the ones asked on logical deduction. The topics included in the book are Direction Sense Test, Verification of Truth of the Statement, Assertion and Reason, Arithmetical Reasoning, Alphabet Test, Logical Venn Diagrams, Blood Relations, Situation Reaction Test, and Logical Sequence of Words. There are a vast number of practice questions for the students, as ample practice is absolutely necessary for cracking such difficult examinations. Moreover, the questions are framed in accordance with the pattern of the questions in the entrance examinations so that the students get to know where they stand as far as the main examinations are concerned. They are even arranged in on the basis of their importance so that the students know where to concentrate more. The answers to the questions are precise and written in such a manner that the students can easily comprehend them. A number of examples are also given along with every topic. A Modern Approach To Verbal Reasoning (Fully Solved) was published by S Chand & Company in 2003 and is available in paperback. Key Features: It includes all the probable questions on verbal reasoning and their solved answers that come in various entrance and competitive examinations. All the important topics are covered, including a special emphasis on logical deduction. There are ample practice questions and examples in the book. R S Agarwal is a chemical engineer as well as a prominent author who has written books like Quantitative Aptitude For Competitive Examinations, Secondary School Mathematics For Class 10, A Modern Approach To Verbal And Non Verbal Reasoning, and Mathematics for Class – 7.
by GOYAL M. C. |RAGHUVANSHI G. S.